I'm doing a laundry basket BOM quilt and 12 of the blocks are appliquéd flowers and stems and such. It's all batiks and beautiful. My question, what stitch and thread would you use? I have done zig zag, blanket and satin on other projects. I have looked at laundry basket designs til I'm blue in the face and I'm pretty sure she does hand appliqué. I did buy a variegated thread but haven't started because I'm just unsure. 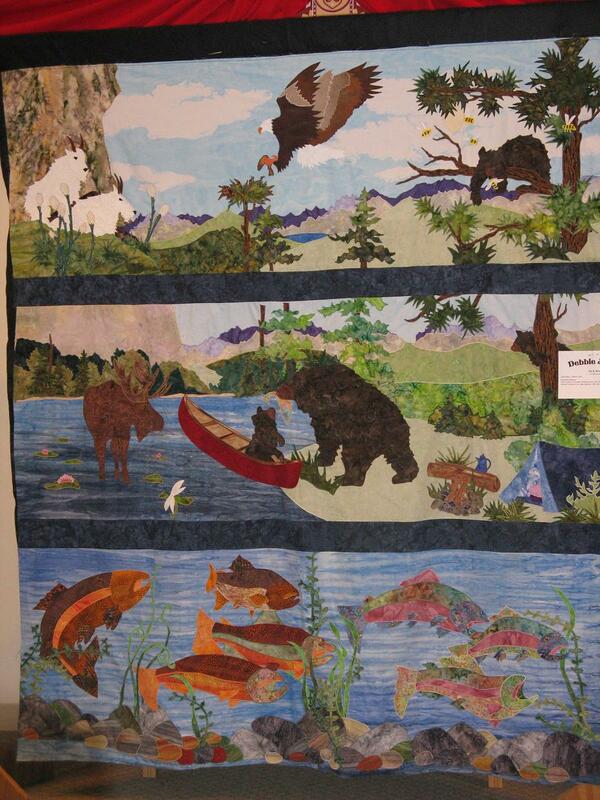 I thought about invisible but anyone who has used invisible knows its like fishing line and I make quilts to use. Help!! I'm not sure if Edyta Sitar does them by hand - I know she endorses Aurifil thread boxes that have 'Laundry Basket' on them. I did her Reaching Out, seen here, with Madeira and Superior embroidery thread because that's the effect I like - a slight sheen for definition. Mine is done with toning colours, including variegated. I wouldn't use invisible as I believe that after a time it does perish. I'm a recent silk convert. I've only used it to hand stitch the back of a binding, but loved the way it didn't twist and just sank into the fabric . It would be pricey, but you'd probably only need a few neutral colours. Use the thread you like the best and don't worry too much about anything else. I love silk too, yes it's expensive but some projects are worth it. What stitch did you use? Zig zag? The vines are not that thick so I didn't want to take any over. I do like embroidery thread as well and I hadn't thought about it, til now. Thanks for your advice! I really want to accent it not overpower the design, yours is gorgeous! Thank you for the compliment! Yes - I used a zig-zag, but if I was going to make another one, I would use blanket- stitch, which I find much easier (that was my first appliqué project, lol). On the narrow vines I just used a straight stitch (remember to make the stitches slightly bigger than for piecing) as I used the ready made Clover bias tape. They were so many, it was worth every penny, lol. 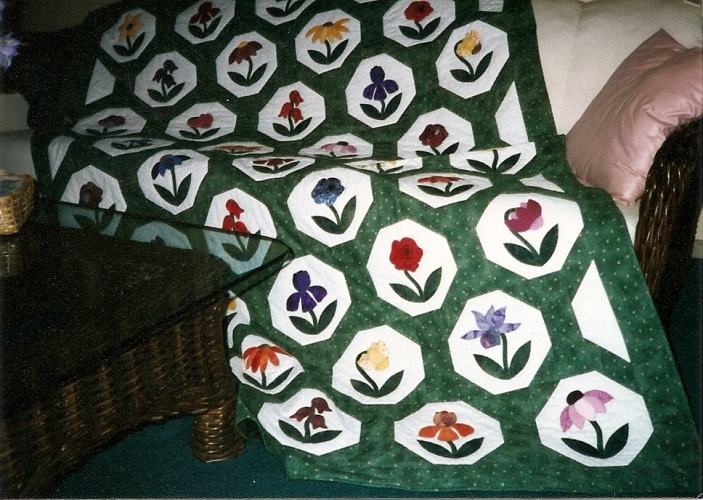 I have made many floral quilts & use YLI Invisible. It is not like fishing line. On the quilts by Laudry Basket that I have seen done at my LQS, they used straight line stitching close to the edge of the fabrics similar to McKenna Ryan's quilts. Those who are practiced, can do it quickly with FMQ. I am usually a bit slower. Knitette, was your applique fused? Or made with a turned under edge? It's fused. I only learned to thread a sewing machine three years ago and have never hand sewed, lol. Thanks! It gives me the courage to try a project like this. For needle turn appliqué I use Superior Threads' Kimono Silk (#100 weight) or a fine cotton thread (also #100). The Kimono Silk is beautiful and disappears into the appliqué. I'm doing a laundry basket BOM quilt and 12 of the blocks are appliquéd flowers and stems and such. It's all batiks and beautiful. Where did you sign up for the BOM? I have two of her books and love her quilts. I didn't see any information on a BOM at the link you provided or is it thru your LQS? My BOM is thru craft town fabrics but I guess it was limited because its not listed anymore, sorry. Thanks for all the advise I'm thinking ill do a zig zag with a neutral on the bottom and embroidery thread on top. I also am doing one of Edyta's quilt's this year- her pre-cut fusible appliques are not hand sewn- the fusible makes that quite difficult- in the class with her she showed us how she does a small blanket stitch - she uses aurifil or silk threads- most of us from the class are using silk thread- it is so fine it pretty much disappears and comes in a huge array of colors. I love working with silk threads- I've been using a light gray cotton in the bobbin. some of the ladies using aurifil are using the same thread top and bobbin. any stitch you like can be used. I wouldn't use a satin stitch though- it is way too heavy of a stitch and (in my eye) would take away from the beautiful appliques. I attended a lecture by Edyta herself. She recommends invisible or monofilament as the top thread and a thread for the bottom that matches the background. She uses heat and bond fusible. Her samples were all appliqued with a zig-zag with her machine on 1 for width and length. Quilting was done by long-arm. Most threads appeared to blend with the background. I have seen samples of her work done by quilt shops that matched the top thread to the applique but that had to have been very tedious and required many thread changes. But they were beautiful as well. I would be curious to see one done with the blanket stitch. I am doing Edyta Sitar's Spring Bouquet BOM as a monthly class at my LQS...we are ALL using machine blanket stitch using a shortened stitch length and they are turning out beautiful. If I could figure out how to post a picture I'd show you how nice it looks! All my applique is done with the satin stitch so it can be machine washed and dried. Even the Mckenna Ryan quilts are done this way. I also did the Reaching Out quilt as a BOM. I did mine by hand and now it is ready for me to quilt it by hand. 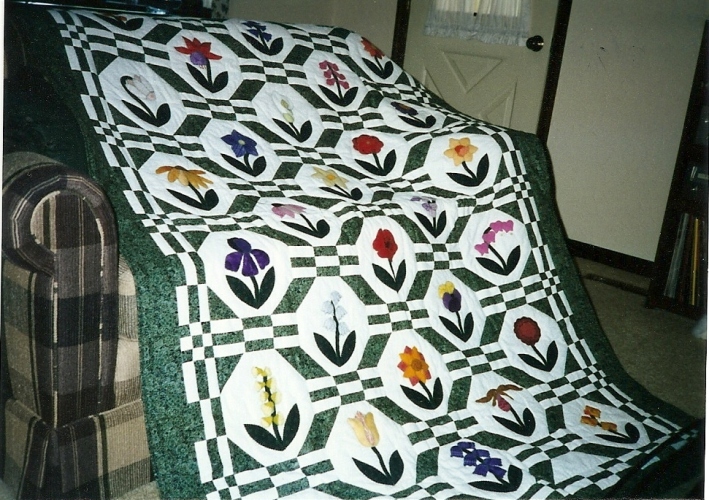 This would be the first quilt that I did all by hand. I used silk thread and needle turn. I have studied with several applique teachers and the best one by far was Pat Campbell and the needle-turn technique. I like it because you are not doing the prep in a least 3 ways. I just put it down and use the invisible stitch she taught; to me it is so much quicker. Applique is my first love in quilting, and I do all hand applique. I love silk thread for it. I realize it is a little expensive, but I use it for all my applique. Try it, you'll like it. I did a number of classes with Nancy Pearson, and believe me, she's the best, IMHO. She uses silk thread for all of her applique. Last edited by fmhall2; 08-12-2013 at 07:06 AM. I teach at my LQS, and am running a once-monthly year-long class for the Spring Bouquet quilt you are making. I showed the women in my class possible stitches, but suggested using the blind hem stitch as it is much less noticeable than the blanket stitch, and less apt to tunnel than the satin stitch. I use stitch length 1.2 and stitch width 1.4, but would encourage you to experiment with different stitches, stitch widths and stitch lengths to see what works best for you. In the end it all depends on what look you want. IMHO, the blanket stitch looks more rustic, or country, the blind hem stitch looks almost invisible, the zig zag shows a bit more, depending upon size, the straight stitch shows quite a bit, I feel, and the satin stitch is thread-dense and may tunnel. I also showed my students how to fuse light weight interfacing to the back of each block to avoid the mess of tear-away stabilizers. We all received the thread as part of the kit, but if you did not, I like Isacord because of the many colors available. If your tension is set correctly there is no need to change bobbin colors; just use a neutral cream, gray, etc. in bobbin weight (I like Superior's Bottom Line or So Fine). Please PM me if you need fabric cutting directions or the packet I put together on appliqué techniques. Good luck...it's a beautiful quilt! I do needle turn applique using YLI silk thread and a straw needle. A straw needle is very fine, so you must use a thimble. And while the silk thread is expensive, I like the way it seems to fade into the fabric. For the most part experiment with various threads and methods and go with what feels comfortable to you. You will find that you will choose a different method according to what project you are doing. and did QAYG with the top stitching. She used smaller stitches and sewed about 1/8 in from the edge. I would love to know how you fused the lightweight interfacing..i.e. what did you use? One of my favorite techniques with the Clover bias is to top stitch it with a double needle. Really holds, keeps it even and it and really looks nice.